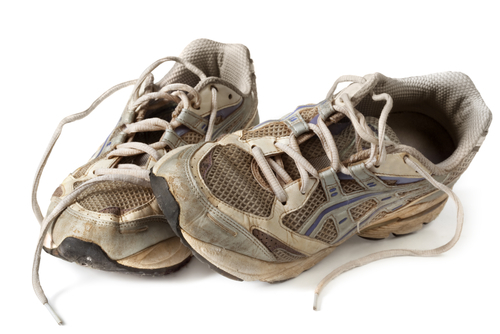 As you work into your running program you will need to keep an eye on how much wear has occurred with your shoes. Running in shoes that have passed their prime is a sure fire way to develop running injuries such as plantar fascitis, achilles tendonitis and knee pain. Knowing that you can expect to get around 1000km from your shoes (+/- 200km ), tracking your shoe mileage will help you anticipate shoe failure and avoid injury. Here are a few commonly used tips and things to look for regarding shoe wear. When you buy new shoes, write the purchase date on the insole or tongue. After that it’s just a little number crunching to figure when they should be changed. For example, if you run 25km a week that equates to 100km a month and in 10 months you’ll have hit the 1000km mark. Some of my running clients go the extra step and write the expected change date on the tongue as well. Up to you. If you find a shoe you really like, consider buying 2 pairs and alternating them in your training. Many runners will do this so that the shoe’s cushioning mid sole has more time to rebound and recover it’s bounce. Although it’s more money up front, you can actually get more mileage overall as the shoes will last longer. Check for folding and creasing of that shock absorbing mid sole. It is the part of the shoe that wears the fastest and when it starts to break down it is definitely time for replacement. 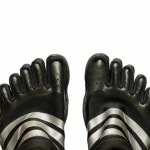 They are still fine to wear as a walking around shoe or to walk the dog but don’t continue to run in them. Remember that your running shoes are for the forwards – backwards stresses of running, not the side – side stresses presented by other sports such as tennis or basketball. Using them for these types of activities strains the shoe in it’s weakest direction and shortens their life span dramatically. Listen to your feet! If you have been fine and seem to be suddenly developing foot pain or focused skin friction, your shoes are often at the end of their life and are no longer supporting you properly. For many experienced runners, this will become the main way they assess how their shoes are wearing as the same problem will crop up as their personal “shoe wear indicator”. They have also learned not to ignore the signs and will change shoes within the week. Running shoes should fit as soon as you buy them. They do not really stretch so there should be no need to break them in. Remember to leave a finger breadth between the end of the longest toe to the end of the shoe. Dedicated running shoe shops can help with proper fit and selection to match your individual foot. We have many excellent retailers on the west side of Vancouver, some of whom are listed in our business links. Most of these retailers also offer running clinics to help with training and motivation. Consider joining a clinic to meet like minded people who will happily share your running goals. See you on the trails and happy running! This entry was posted in Avoiding Injury, Running and the SunRun and tagged injury, injury prevention, Running and the SunRun, running shoes, shoe wear, Sun Run, sunrun. Bookmark the permalink. 2 Responses to Running shoes – when to replace? I look your great blog first, you have given us so useful information, would come again and love it.